All #together now…some quick predictions for JESC 2014! O, JESC, why art thou so hard to predict? Every November I find myself tearing my hair out with indecision over who’s going to end up where on the scoreboard, and I’m finding it more and more difficult to disguise the resulting bald patches. This prediction dilemma isn’t something that tends to happen with adult Eurovision, despite the fact that there are a bajillion more entries to contend with. Anyone with an explanation for this phenomenon, please call me ASAP on 1800-NO-CLUE. 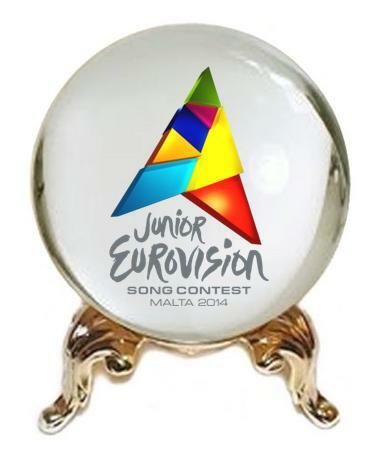 Then sit back, relax and read through the following extra-quick (I’m a little time-poor at the moment) and extra-questionable predictions for Malta 2014 – due to begin in a matter of hours! Hashtag unbelievablebecauseKyivseemslikeyesterday. Anyone who’s made a full scoreboard prediction and gets it at least 50% right, deserves a medal in my opinion. Psychics not included. Well, that’s all I have time for. I’m sorry if this post seems rushed, but that’s because it was rushed. I’ve got a super busy weekend ahead of me – so much so, I won’t be watching JESC live tonight *insert sadface here*. Instead, I’ll be watching on actual television tomorrow night when we in Australia get the (slightly, by past standards) delayed broadcast, complete with our own commentators. That’s after I’ve been gallivanting around all day, which in turn is after I’ve spent tonight dancing up a storm at my very first Euroclub (more on that to come next week, fingers crossed). So, as I head off to cover myself in PVA glue and dive into a swimming pool full of glitter in preparation, I wish you fun times watching Junior Eurovision 2014. May the show be epic, may the voting be nail-biting, and may the best song win! Posted on November 15, 2014, in Junior Eurovision and tagged Armenia, best and worst, costumes, Cyprus, Federica Falzon, JESC, Junior Eurovision 2014, Malta, predictions, scoreboard, Sympho-Nick, Ukraine, winner. Bookmark the permalink. 5 Comments. Jaz! The show was UH-MAY-ZING! It really raised the bar, not only for JESC but ESC! The organizers for Vienna are going to have a hard time topping, not only Copenhagen, but Malta. All the performers helped the show out big time by performing so well. Italy took us to CHURCH with all that soulfulness in his voice. I can see why he won, even if I’m not a fan of the song. Poor Croatia; she looked adorable and the song was pretty good, but it wasn’t her night. Ukraine also let me down a bit. Something was off about the live performance. P.S. This happened and I am not over it yet. Nick! This wasn’t my favourite JESC (song-wise or show-wise) but it was pretty darn good. It’s gonna be a tough decision for the panel of the Shipbuilding Makeover of the Year Awards (that’s a thing, right?) choosing between Copenhagen and Malta, that’s for sure. Ukraine weren’t as perfecto as I was hoping, but I thought they’d improved sooooo dramatically since the NF (as Ukraine always does) that the girls didn’t met me down. I enjoyed Sweden too! Julia was one of the weaker vocalists of the night, but next to poor Josie she sounded incredible. And it’s true – another great leap from NF to the actual show in terms of performance and charisma etc. And I don’t care what people are saying about bringing ABBA back…those glittery outfits were BOSS. #want. Woohoo for your brush with Madcraft!! I read your blog post and it was really something. TBH I felt kind of…moved after it!! I didn’t know where to start with a comment, but I will try ASAP 🙂 Here’s to the power of (Eurovision-related) music!! Yes, it’ll be such a hard choice! I think id give it to Copenhagen, since they had more to do and less to start with. But both teams were amazing. Ooh, yeah, Ukraine was a little rough. As was Sweden, but I liked the song enough to look past that. xD And omg, the outfits were totally on point. SO glam hippie.